The haphazard and scattered arrangement in the home disturbs the normal flow of Chi and generates problems. Some people have a habit of accumulating things. With a view that these things may be required in future, they keep their boxes and cupboards overloaded with it. Otherwise things remain scattered in rooms. Certain things remain hanged on walls. The books remain scattered here and there with dust accumulated. There are clothes in wardrobes that are never worn but are kept with a view that perhaps it will be used by children but later on children refuse to wear it. Such things create clutter. These should be removed. Their removal is beneficial as it helps in forgetting the past and gives confidence for the future. When all disarranged things are removed, the residents feel rid of burden. There is one more method to deal with this clutter. Keep all extra things well arranged at a proper place. This will not retard the flow of Chi. For example, when you change clothes before going to bed in night, do not keep clothes scattered on bed or chair for 8-10 hrs. Remember that scattered things retard flow of energies such as keeping fading flowers, not cleaning leaves of plants, not cleaning bath room, allowing soap to remain stuck on floor, keeping doors and windows that crackle, to keep books wrapped with dust, to collect torn clothes. 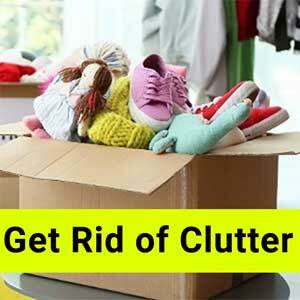 It is essential to get rid of this clutter otherwise the residents will become years behind in life. This clutter stops Chi and damages it. Obsolete things should be sold or given to needy. Old audio and video cassettes. Stopped wrist and other watches. Collection of not required things pulls the people backwards. After getting rid of undesired things light incense sticks every day in home. A bell may be ranged after worship. The home should be energized. The smell of incense sticks or sandalwood powder is good for progress.